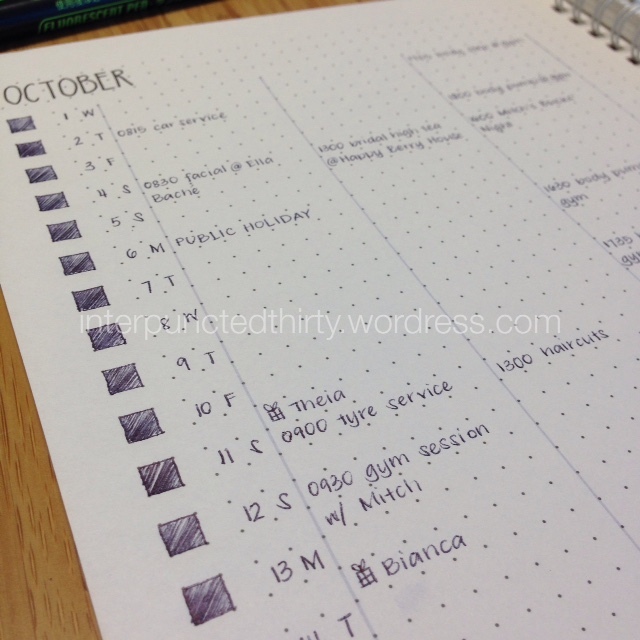 Part of this year has been trying to find a planning/organisation system that works for my personal needs. I’ve got the work life organised down pat, but it’s navigating through my dynamic personal life that’s proven to be challenging. I thought I’d write a few thoughts about the systems that I’ve used this year. But before I get stuck into it, I ultimately had a goal in mind: a planner and/or organisation system that is flexible and adaptable enough to accommodate for my (ever-changing) needs. Was it really that much to ask for? By nature, I’m not the kind of person who has time to decorate my planner pages with washi tape, embellish with doodling, etc. I’m straight down to business, and for me, the decorations and trimmings are more of a distraction, although you’ll find me doing something really wild, crazy and uncharacteristic like using calligraphy to denote a special event. Hah. Don’t get me wrong, I really enjoy and appreciate the many beautiful planner pages I see on my Instagram feed, but I always wonder where people get the time to do this and do they plan to plan their planner pages? That being said, I’m a collector of conversations (my own (yep, lots going on in my head! ), my own with others or overheard) and I like to log my days via what I like to call “daily souvenirs” (e.g. business cards of food haunts, pamphlets, etc. ), so when I do get some me time, I go rampart with the visuals and it looks like a kindergartener’s pasta craft activity. I kid, but let’s get down to it, shall we? I’ve tried 5 different systems/planners this year, going back and forth several times in the year to use each one, unless I thought it was totally useless and I’ve abandoned it completely. I’m not posting a lot of pictures in this entry because there are bits of info that I would like to keep private, so this is going to be a text heavy post. At the end is a run down of what I’m currently using and will be using going into 2015. The number of views I get a day for my rendition of the Bullet Journal system averages about 300 views a day. It’s basically my entire traffic this year. As much as I like how dynamic this system is, I’ve more or less ditched it. Below was my last attempt at adapting it to my needs. This was the monthly pages. I divided it up into three columns – morning, afternoon, evening – and then wrote down the events and appointments for each day under the appropriate column. The coloured boxes to the left of the dates was used to signify when the day was completed and was more a tracking tool for me. This was a monthly bullet journal (as opposed to daily and weekly) with a little calendar written on the top left hand corner of the page as a reminder. I used the same signifiers/bullets as I have in previous posts. In the end, this didn’t work for me because, again, my needs changed. The Verdict: I like that it’s adaptable enough to use with any system, that’s why I’ve used some of the bullets/signifiers going into my current system. I can’t live without forward planning, and sometimes I don’t have my phone with me, or I run out of battery, and then I’m screwed. There are so many creative hacks out there to handle this, and I’ve tried them all. I also had a problem with collections. I found myself ripping out pages and sticky taping them into my new pages or I re-wrote some of them during my lunch hours. Argh! Too annoying! I think the bullet journal has some strong elements to it, but after using it for a year and a half, things like archiving (i.e. what do I do with my old books, notes, etc.) and migrating information between notebooks, has really been challenging and I need something that is less fussy. I actually didn’t go out and buy an authentic Filofax, knowing full well that I’d only use it for a little while (hmm, maybe this was a self-fulfilling prophecy in itself?!). I ended up making my own out of cheap materials – an Officeworks A5 binder, DIY Manila folder dividers/tabs, and DIY planner pages. The Verdict: This tryst ended quickly. The prepping was fun, but when I got around to using it, it felt like I was carrying around too much unnecessary crap. Did I really need to be carrying around 6 types of sticky notes and a multitude of coloured pens?! The weight in my bag certainly didn’t help with my back problems! I want to be organised but I don’t want to be a freaken packhorse! I also didn’t like how I had to punch holes into anything new I wanted to put in it, which meant carrying around a heavy arse hole punch. Yeah, I’m not a binder type of girl. (On a side note though, I bought myself a smaller version as a birthday present, and that ended quickly, too. I’m thinking of regifting my own birthday present, or maybe a giveaway if I reach a certain number of followers or views? Who knows, nobody actually reads this blog except for my mum – hi mum!) What I did like about this system is that you can compartmentalise and organise information into its place – love, love, love! And that solved the problems of the lists I wanted to keep with me everywhere I go, but the cons outweighed the pros, unfortunately. More like a fauxbonichi. I was smart about this and didn’t go face first into purchasing it. I used grid Moleskine cahiers and HAND DREW the pages for one month. The Verdict: The prepping killed me! And once I got around to actually using it, I didn’t fill up even close to a seventh of a page. I really liked the page layout of the Hobonichi Weeks, so I’ve appropriated elements of this into my current system. I created a small notebook with some DIY pages that looked like the Moleskine planner. I used this type of planner for many many years, and when I started uni again, it just couldn’t keep up with me. The Verdict: I actually used this far longer than the others mentioned above and used it with the bullet journal signifiers/bullets at one stage as well. I found that I would run out of room sometimes with my daily log/souvenirs, and it got ridiculously chunky at one point with the amount of pages I taped on. I made a foamdori earlier this year, and I ended up using this with the makeshift Moleskine planner and I created a couple of other inserts as well. The Verdict: My foamdori disintegrated after a couple of months use, so that’s more of a material/design flaw rather than a complete system failure. 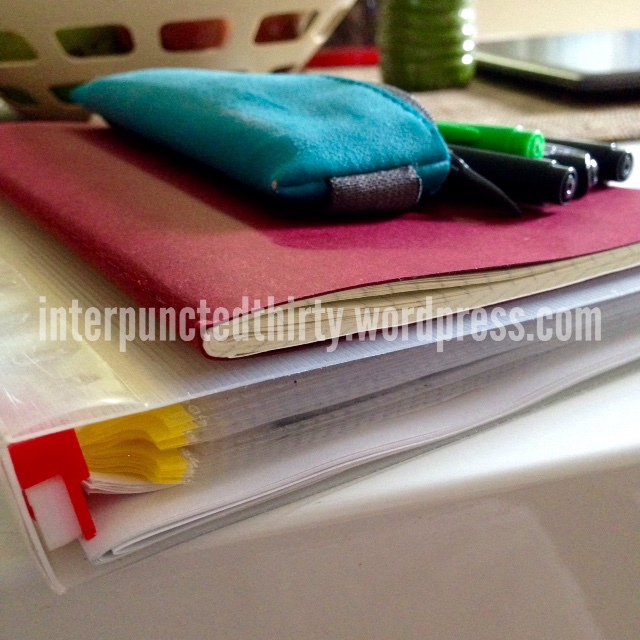 I had six inserts to begin with – planner, to do lists, blog, logbook, writing journal, sketch book – and boy, that created weight very quickly. Once the foamdori kicked the bucket, I wasn’t bothered making another one. My current system is a use of several systems. 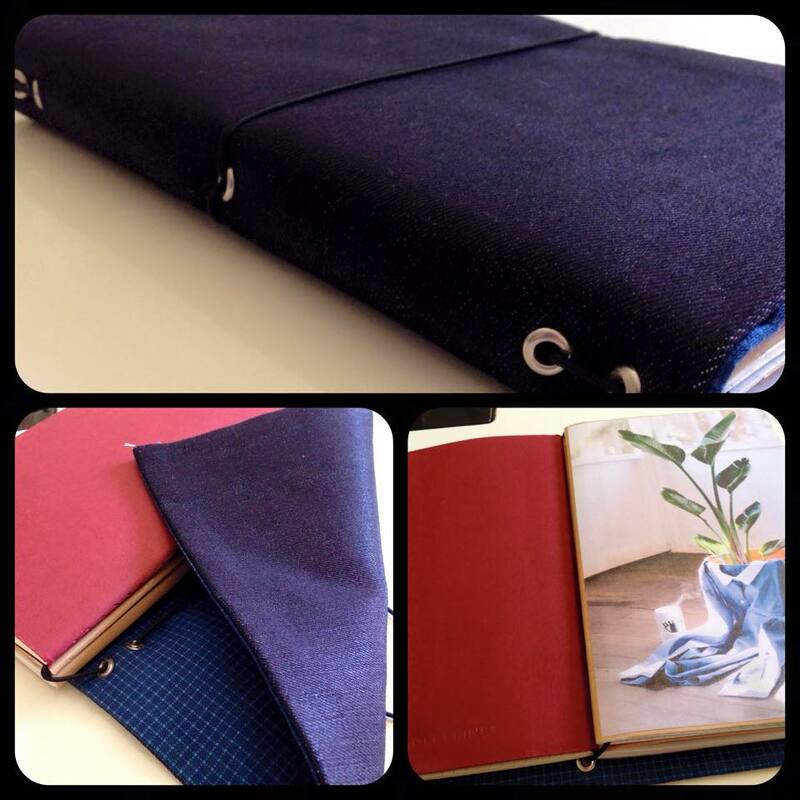 I made a denimdori the other day for my inserts, now down to just three – 1 x planner, 1 x combo To Do/Logbook, 1 x combo Blog/Writing journal. The denimdori was made out of leftover Japanese denim and a fat quarter with fusible web ironed on the edges for reinforcement, then I used eyelets for the holes and some hat elastic (aka tube elastic). It is handstitched, but it was my first official day of holidays, so I decided to slow down. The covers of the inserts were made from magazine pages I had lying around. It’s holding up so far, but I really need to get some rubber bands to hold the inserts together. My planner pages are weekly on one page with notes on the other side. I leave a spare pocket at the front to hold my planner insert on the days when I know I’m not going to need anything else. I’ve only started using it at the start of December, but it just feels right. I’m not obligated to carry both the folder and denimdori all the time and can swap them around as my needs change. So how has your year of planning gone for you? Have you found a planning system that suits all of your needs? What have you found challenging and useful? 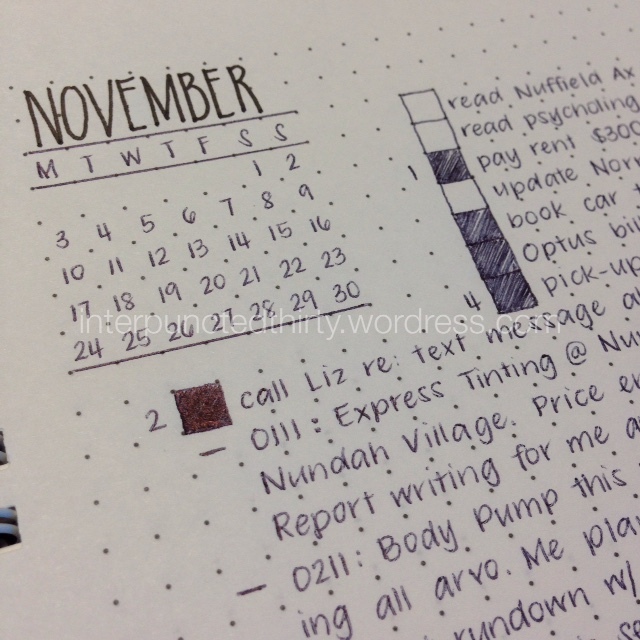 Well… I have reached planner peace. I started with a lined bound A5 Paper Luxe brand notebook, for bullet journaling, but got annoyed with the lack of calendar/forward planning, so I did more of smashbooking in it than any actual planning. While browsing IG hastag “journaling” I came across MTN, and from there I just got hoooooked. I bought DIYFish, and then I got annoyed with the font (haha yes) so I made my own, with nice large fonts for the month and headings. It went through so many versions.. 1.1 up to 2.4 when I finally satisfied with my format. Now, 3 months later, things are winding down and I’ve added a bullet journal to my system and I don’t know why but now bullet journal works for me, but it didn’t before, I guess I wasn’t used to it before or I didn’t give it enough time/chance to get used to it last time. And now my planner pages seem too much as they are Day on 1 pages. I’m currently designing a week on 2 pages insert to use for 2015 planning, plus my BuJo as the perfect braindumping tool. Wish you luck for 2015 and happy holidays! I’m now hoping to reach “cover peace” lol. i see all these pretty fauxdori on etsy and go I WANT IT! There is a metallic purple one! And those watercolour looking ones.. oh so pretty.. I have read some of your posts about your planners and just had to leave a comment. I think that we are pretty similar in that I, too, get sick of what seems like excess work in keeping a planner going. I have to plan forward, so the bullet journal makes a lot of extra work for copying, and I don’t want to flip through so many pages to find something. I definitely like some of you ideas and plan on implementing them myself! I do know, though, that I also get bored when I use the same planner for too long! I always think I will find the correct program or system or notebook, but I can’t seem to make the choice STAY correct. I hope you’ve found YOUR correct one… your “planner peace” and maybe someday I will find mine!! Like you, my work side of my life is pretty formatted, though I admit I’m only about 80% of my structure I want. I think it’s more of a job duty thing instead of me at this point. I just started using the Bullet Journal process and it’s working for me. I freely admit, organizing my dynamic life is not my strong skill and this is going to take me a while. I do like the simplicity of it and I can’t simply ignore the reminder like I can on all of my electronic processes. I think you and several other comments have hit the head on the nail though – how to plan forward. I’ve been creating a section that allows me to remember things that need to be entered for next month. I’m going to keep at it for a little longer and then upgrade to a better notebook than the little one I’m using now. But I have no interest in washi tape or decorations but completely admire those who do! Thanks for your comment, Jeremy! How are you going with the things to remember section of your planner? How do you implement it – is it like a bullet journal collection, a notation at the bottom of the page, etc.? I’d be keen to give it a go if you had some examples you’d like to share. My apologies for not replying sooner, life swerved this year. Toyour question, I was using a section for “next month” on my monthly pages. Side note, at work I started using the Bullet Journal concept in my OneNote. Works great! The Bullet Journal has clicked with me (it is how I stumbled over your blog), and initially I was worried about forward planning: this is the direction most of my online searching went. Calendex solved that for me, I write the note on the current page and add the page number to the day on the calendex. Easy. I do have limited upcomings though, so those with a lot that are more then a month cold get overwhelmed. Maybe. It works for me anyway. I tried to get my wife to start a Bullet Journal, but she wouldn’t stick with it; she now uses a Leuchtturm1917 A5 Planner, days on left and space on right page for lists etc, and far prefers it. Thanks for the suggestion, Nige :) I might have to give that a go before i totally write it off! I absolutely love this post because you talk about every kind of planner I know. Your hybrid is very clever and definitely the best choice! Thanks Julia :) hope it’s helped you in some way! I too am in search of planner peace. Just wondering if you are still using the system you spoke of in this blog and if you have made any changes? Thank you for responding. I will check it out. 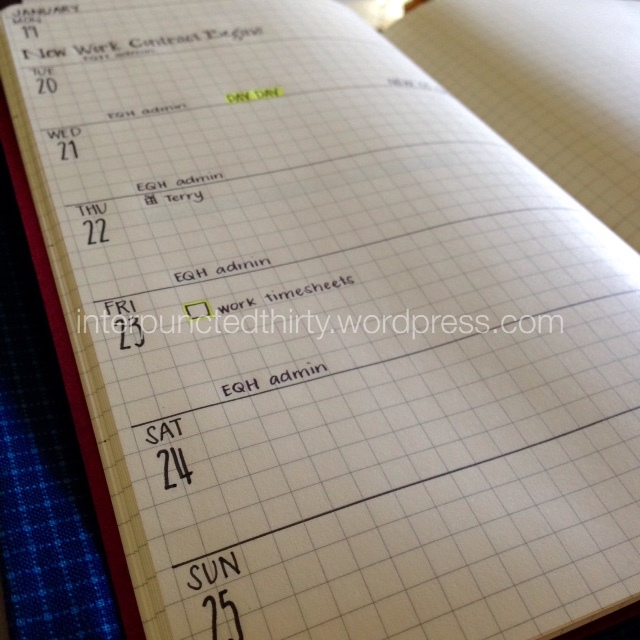 I am new to the planner organizer…but have been keeping a monthly calendar for a couple of years. I recently picked up a Day Runner month on 2 pages to try for the last quarter of this year. After using it for the rest of 2015, I will know how to tweak it for 2016. I use an erasable pen for writing in my planner. I’ve got room for notes on the right edge where I write in with bullets Goals for the Week, and on the open spaces for previous/up coming months I fill in Goals for the Month. As the goals are met, I fill in the bullet, so I can quickly see which didn’t get done and can do them as time allows. I can’t tie things down to particular days, so I do the weekly and monthly goals. I have sections set up in th eplanner for on going to do lists at both of our homes, items needing to be purchased for projects, an address/phone number section, a follow-up section and a section for some notes and thoughts. It’s working so far, but I am not artistic, and don’t intend to do any decorating other than some nice images that I printed to stick on my dividers. I like that I have everything I need at my fingertips. In retrospect, if I had purchased a binder (I like the ring binder because I can add pages/sections as needed) with a full zipper, I could use it as a wallet. As it is, I use only a small wristlet that holds my smart phone, a couple of credit cards and some folding money, so to bring my Day Runner, I usually leave it in the car, but it’s handily close by as needed. Soooo much easier. I do use a free online calendar because it will email reminders to my husband and me, as well as emailing us both at the beginning of the week with our commitments for the upcoming week. This is handy for my husband who doesn’t keep a planner. Currently I use House of Doolittle Calendar Planner, Monthly 6.8 x 8.75 inches. I like a smaller size so it can go in my purse or car with me. I add appointments, reminders, notes of events that happen, quotes, etc. This is large enough to be functional but small enough to keep in my basket or toss in my purse when I go out if I know I’m going to need it, which isn’t often. I use post-it notes for to-do lists. These are easily moved from spot to spot in my calendar, or tossed if completed. I can pre-plan by putting notes and post-its further in the calendar. I wrote in dates, 2 per page (both sides of each page) until I had the entire year done. (So one page has 2 dates per side of page, so a total of 4 days on one piece of paper.) Then I wrote in every birthday and anniversary. Now I have a permanent spot for them, and look ahead on my organizing Saturdays for each month to plan for those monthly. I now also add dates in history that I want to remember. “2015 Review.” I take my monthly calendar at the end of each year and write in the major events of the year onto that single page. Then I TROW AWAY my calendar for that year. I have approximately 50 pages, so if I do one side of a page per year, then this will be enough for my entire life. All bills, mailing addresses or internet addresses, payment amounts/dates, account numbers, etc. I generally pay bills on Saturday mornings when I am going through the stacked-up mail. I pay online bills at the same time. I keep a month’s pay in the bank, so I pay bills when they come in or are due, not having to live paycheck to paycheck. This makes a HUGE difference in the amount of financial stress I have to live with. 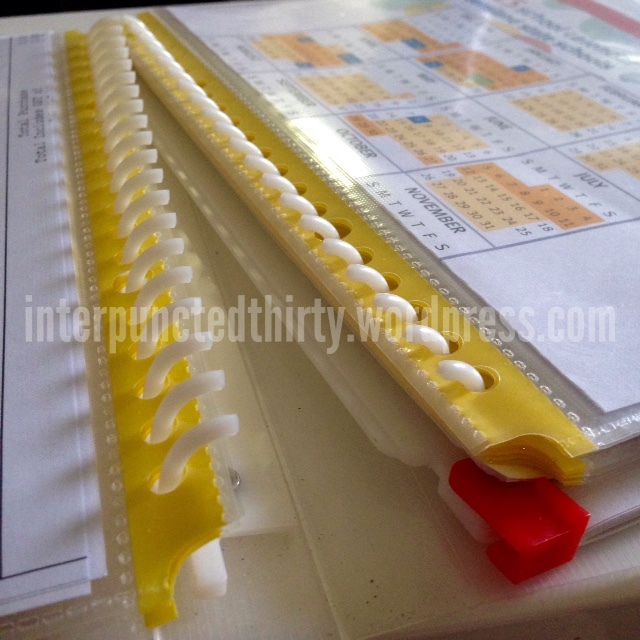 Everything I need to stay organized in home schooling our kids. Everything is in ONE spot, at my desk, where my computer is. This makes it easy to stay organized, and doesn’t require any upkeep except buying a new calendar every year. The other thing I do is try to weed out any “fluf” in the system, or any clutter that happens, but this has become a habit and I don’t really require any extra time for it. We recently moved, and everything went into our U-Haul except for what I packed in my car: the pets (2 cats and 1 whippet), my work computer, and my wire basket. Once we got to our new house, I had all the tools I needed to start work 2 days later – I telecommute from home, so it was critical that I was organized very quickly. As a side note, I highly recommend The Life-Changing Magic of Tidying Up: The Japanese Art of Decluttering and Organizing by Marie Kondo. Soon, my entire house will be tidied up, and it truly has made a huge difference in our lives. I love you ideas!!!! I am a therapist and have been looking for a way to organize everything from school to work and clients, and personal life, wisdom and stuff and your suggestions are amazing. On a practical note, I am wondering what pens you use because they come out looking amazing and what is the ring binder that you got from daiso?? That is exaclty what I have been looking for but can’t find anywhere!! So I would just like to say that your handwriting is perfection crafted by angels. Is there a font that inspired you to write like that ? And if you ever have time do you think you could post a picture of the alphabet in your handwriting in common and capital letters and the quick brown fox sentence?